Pics and Kicks: Photoshop Template Giveaway: Grady Bug Designs! Photoshop Template Giveaway: Grady Bug Designs! Ashlee of GradyBug Designs is giving away one of the following three AWESOME Photoshop templates to one lucky Pics and Kicks reader! Comment with which of the three templates featured above you'd love to win. Be sure to check out all of Ahslee's other awesome templates for photographers here. She also has all kinds of other fun stuff over in her Etsy shop for you to love! Be sure to have your entry in by midnight Sunday night! I was debating between #1 and #2- but since I've never sent out birth announcements for any of my kids, I'll pick that one so we can at least have one made for this baby and maybe one for the other boys' memory books as well! I'm loving #1. It's awesome and I love the layouts! And I've already put the links up on my twitter AND facebook. Does that count for an entry each? I just RT'd you on twitter, which also means my FB. Entry #2 for template #2! I love all 3, but if I have to choose, I'd pick #2. I am LOVING #1! Woohoo for giveaways! You rock! The birth annoucements are DARLING! I think I'd have to go with the Birth Announcements myself. They are all great, but I really could use and would love to win #1! I love them all but #1 is by far my favorite! Love your blog! I love #1 the storyboards! This is just what I need! I LOVe the Baby announcements! LOVE the birth announcements! So I would love to win #2! Thanks! I just posted a link on FB! :) entry #2 for the birth announcements! 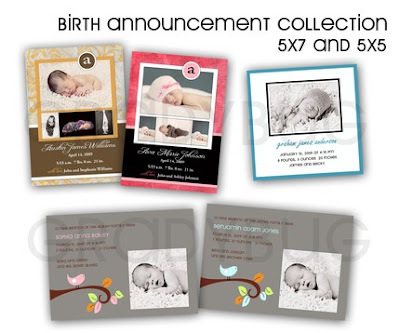 I would love LOVE LOOOOOOVE #2 the Birth Announcement Collection! Those would be super fun!! Yay!!! Thanks for doing this! and would luv to win #1. I like the birth announcements! I love entry #2 Birth Announcements. I have posted on FB. Thanks! I think they are all great, but I would love to win #1! I love LOVE the Birth Announcements! They are so hip! Whoops! I hope this doesn't mess up your random number generator or however you choose the winner, but my email address is anniewebbphotography@gmail.com. They are all wonderful. I would love the baby announcements! Thanks! Love them all, but I'd have to go with #2 -- more options for clients to choose from! I want the Birth announcement one!! So cute! All are adorable and my clients would just go crazy for all of them, but I love the birth announcements! Very sweet and creative! Thanks again - I am still loving #2! Ok I love them all!! but since I am almost 7 months pregnant, id have to choose the announcements which are awesome!! both of you rock for the giveaway!! #2 takes the cake :) Great designs. I wish I were allowed to enter my own giveaway! :) I'd choose number 1 . . . but it would be hard NOT to choose number 2 . . . luckily they're all really fairly priced, so I'd probably end up buying whichever one I didn't win. . . or both if I didn't win at all. Hmm... glad everyone's as excited as I am about Ashlee's awesomenes! Sorry I jumped into this so late..I hope that doesn't hurt my chances of winning. I love giveaways....one day I WILL WIN!! 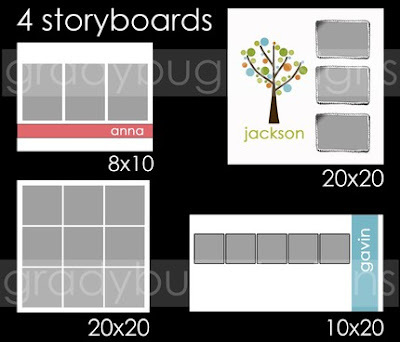 I absolutely love the storyboard: the tree one...and if I were having a baby the baby announcement with the branch. This lady is SO talented..I love the talented women/moms...love it. By the way, here is the link to my facebook...I hope many people come to the etsy shop..it is awesome. Hello - I would love the storyboards (#1). Thanks! #2! it's just what i've been needing!! so excited. i just love giveaways! 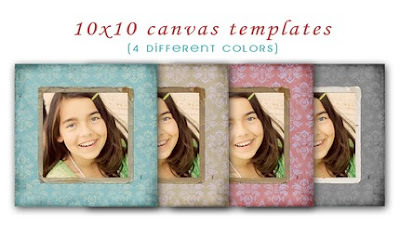 I love the 10x10 canvas templates!!! So cute. I love #2! So adorable! Thanks for the give away!! I posted a link to this in my blog! So excited! hmm.... thats a tough decision. I really like #1, so i'll go with that one. i just twittered the URL to this blog! I would love the birth announcement collection... with a baby on the way and birth story photography... yes please. Also, can you email me with your vendor for the standouts you mentioned on your last post? I haven't heard of them. I would love to win the birth announcements one for my new baby on the way! Oooh!! I want the birth announcements!!!! #2 Birth Announcements! They are so nice and something I would and could use. So hard to decide, but I think #1 would be my pick! I'll take any of them. They're all fab! just left a link on facebook about the giveaway!